Just quick snap which you may have seen on Instagram or Facebook. 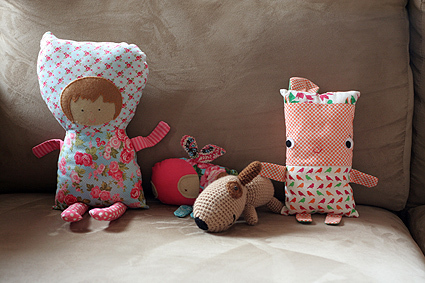 Three dolls, made with the cute Elise Doll pattern by Erin from Candy Kirby Designs. At least two of these girls are going to Softies for Mirabel along with Eddie. These four little guys have made the trip to Melbourne to join their friends in the annual Softies For Mirabel appeal. They will find homes with kids whose lives have been touched by or abandoned due to parental drug use. If you have any spare change this Christmas you can donate here. 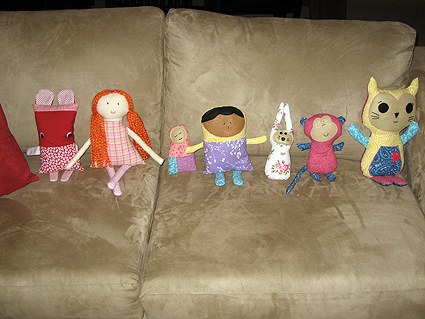 Here are the softies I made for the 2009 appeal.